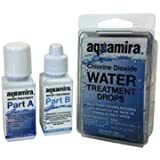 Amazon's Choice for "aquamira water treatment drops"
Ships from and sold by HandAProduct. Not liable for use with nonpotable water. You can never have too many options for treating your drinking water while in the mountains. 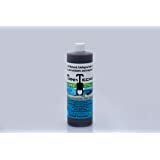 I use Iodine, Chlorine Dioxide (Aquamira), Water filters like Katadyn or LifeStraws and have even used a Steripen. Each have their Pro's and Con's but I find Iodine tabs to taste the worst but be the most compact and easy to use. A very small set of sealed Iodine tabs live in my pack always. Aquamira is my "Go To" choice for lightweight packability and use and comes on every trip. They last for years and treat HUGE amounts of water. Some people say there is a taste, but I think they make some great water out on the trail. They even kill Cryptosporidium after 4hrs. 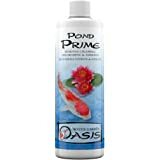 Combine this liquid treatment with a large lightweight bladder and you've got all the treated water you could need and never have to pack a heavy filter again. Luckily, I haven't encountered any situations where I required large quantities of self-treated water. <knock on wood> I'm fairly certain the product will work as advertised. As a boy scout, about a million years ago, I became pretty familiar with multiple treatment options - and I think this one is the best for my needs. 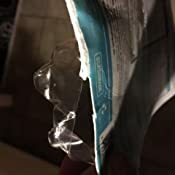 This review isn't about the product itself, it's about a small but important detail : packaging failure! My purchase of the 2oz. "bulk" treatment back in 2014 was part of ongoing hurricane preparedness efforts. I check my non-perishable supplies at least twice a year to replenish & rotate as needed. 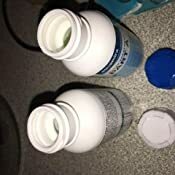 The expiration date marked on both bottles was "May 2018" - which as I write this review is 10 months in the future. Starting in June (start of hurricane season) 2016, I noticed the "Part A" bottle was no longer completely intact. It was "crunchy" but it wasn't yet leaking. I put it in a zip-lock and left it alone. By the time December (end of hurricane season) 2016 came around, there was a bit of leaking. Probably because I squeezed the bottle to test its integrity back in June. NBD, I transferred the contents to another bottle (thanks to the TSA, I have many now) so - problem solved. But this is still pretty disappointing for a product likely to sit for long periods of time before use. If I wasn't quite as diligent as I am about inspecting my supplies I could have been counting on treating 60 gallons of water and been SoL, or the leak could even have damaged other items. As a pool owner I'm pretty familiar with the volatility and danger of chlorine - which "Part A" of this product contains in dilute form. It's very good at attacking plastics, metals, concrete. Just about anything except glass. I'm not advocating for a switch to glass bottles. But plastic that's at least a little thicker would probably be in order. Or maybe some sort of coating? I don't know, that's for the Aquamira experts to figure out. In the meantime, if you're prepping - for whatever - be aware of this possible issue and inspect your supplies for it. 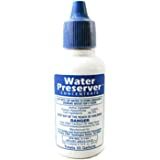 5.0 out of 5 starsThey make water safe, what more do you want? As far as I'm concerned, these drops are a must-pack for basically any trip into the outdoors. They're easy to use, and they've allowed me to safely drink water from a bunch of different streams without any kind of sickness or any other issues. They're also lightweight, easy to pack, and last a long time, as purifying one liter of water requires just 8 drops from each bottle. There are a few downsides, though. First, you have to wait about a half-hour for the water to be safe. 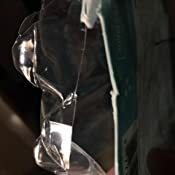 Second, some people complain that the drops make the water have a slight chemical taste.. Third, you do have to be careful to dry off the rim of your water bottle—if you scoop water you'll likely get water on the outside of your bottle's rim that will be sealed off from the rest of the water when the bottle's closed. That means that it won't be treated and could still contain bacteria or viruses. However, none of these are serious problems in my opinion. Waiting a brief time to drink after refilling your water isn't a big problem (especially if you've planned well), and it's not hard to remember to wipe off the rim of your water bottle. As far as the taste goes, I suppose it's personal, but I find that at worst it just tastes like drinking town water in many towns. The quality of the water you scooped up has more of an effect on its taste than these drops do, in my experience. In short, these are great option for any kind of wilderness adventure. 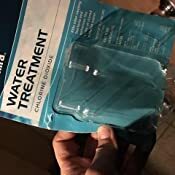 They can make practically any water safe from pathogens, they're lightweight and easy to use, and while there are a few downsides I think they're outweighed by the convenience of the lightweight/easy-to-pack form factor and the safety factor (not all filters will filter out everything that these can kill). 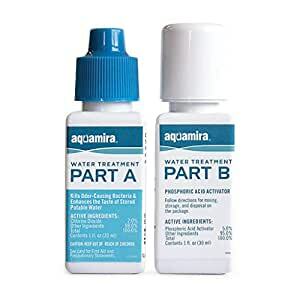 I have used Aquamira Treatment DROPS before, in the 1 ounce package. Beware that the Amazon title for these says DROPS, but there is no dropper. The size of drop you get will be dependent on the dropper that you use, so I wouldn't trust the drop instructions, unless you have and are refilling Aquamira dropper bottles. I am still able to use the product by carrying a 1/8 tsp with me. 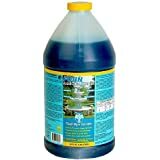 This version of the product works better for treating large volumes of water. If you want to treat a quart at a time, you should get the dropper bottles instead.